Should states ban abortions when Down syndrome is diagnosed? PLAIN CITY — Kelly Kuhns rejected Down syndrome testing the first three times she got pregnant; the 36-year-old nurse from Ohio always knew she’d never terminate a pregnancy. But after her third pregnancy ended in miscarriage, she decided with the fourth to take the test. In this undated photo, Kelly Kuhns holds her son, Oliver. Kuhns is advocating for an Ohio bill that would ban abortions based on the type of pre-natal Down syndrome diagnosis she received for her son, Oliver. https://www.delgazette.com/wp-content/uploads/sites/40/2017/09/web1_DOWN-SYNDROME-092517.jpgIn this undated photo, Kelly Kuhns holds her son, Oliver. 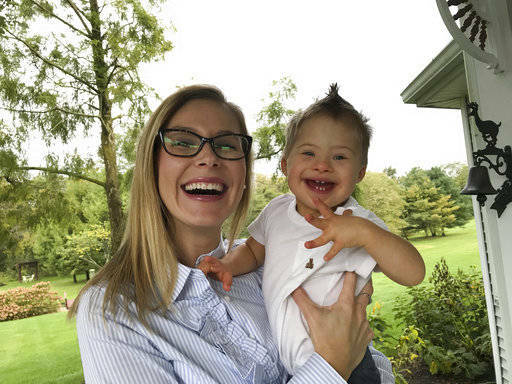 Kuhns is advocating for an Ohio bill that would ban abortions based on the type of pre-natal Down syndrome diagnosis she received for her son, Oliver.